Good morning! It's a cool, overcast morning here in the northeast. The house is still quiet, my coffee is poured, and I'm ready to settle in with my laptop and compose a Sunday Salon post. 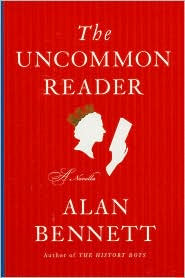 I spent Friday evening with Alan Bennett's The Uncommon Reader. How is it that I missed this author and this little gem of a book? Most commenters on my library loot post loved it, and a couple others plan to read it soon, yet it was barely on my radar until I saw several positive mentions last week. The premise is simple. The Queen of England happens to wander into a traveling library van as she chases her corgis outside Buckingham palace. Once inside, she feels it only polite to check out a book. However, not being much of a reader, she has no idea what to choose. She settles on a book written by an author whose name is familiar. Guided by Norman, a kitchen boy, the Queen gradually begins to develop a passion for reading. To the dismay of others (including the Prime Minister), this occurs at the expense of her official duties. "...she was finding...how one book led to another, doors kept opening wherever she turned and the days weren't long enough for the reading she wanted to do." This "dawn of sensibility" was mistaken for the onset of senility. Efforts are made to curb the Queen's reading, as her growing self-discovery begins to steer her toward writing. In addition to some very funny lines, there are wonderful lessons found within these 120 pages. I can heartily recommend this book to nearly everyone I know, and will be on the lookout for more of Alan Bennett's work. I've seen some very positive reviews for The Clothes They Stood up In! This week I'm looking forward to reading The Secret Scripture by Sebastian Barry. It is the last book on my list for the Spring Reading Thing. What will you be reading this week? One final thought to end this Sunday Salon post... Jackie at Farm Lane Books posted a request that we add search boxes to our blogs. This sounded like a very good idea, so I immediately added one. However, upon testing, it does not appear to work. Does anyone know what I did wrong? Library Loot is a weekly event hosted by Eva and Alessandra that encourages bloggers to share the books they've checked out of the library. My trip to the library, thankfully, yielded a number of slim, fast reads. This will hopefully allow me to stay on track with scheduled reads and enjoy a few diversions! This book has been in my hands so many times at B&N, but a few mentions around the blogoshere this week prompted me to finally pick it up. I read 20 of its 120 pages last night, and know I'll want to read the rest of this delightful book in a single sitting! Her previous essay collection, Ex Libris, and her book The Spirit Catches You and You Fall Down were both wonderful. I plan to read a couple essays from this book as part of the 2009 mini-challenges. Finally, a couple more graphic novels. Both of these were recommended by Claire at Kiss a Cloud. Reading these will complete my graphic novel experiment. This is Abouet's story of an Ivory Coast childhood set in the 1970's. Kamung Boy is about Mat, a Muslim boy growing up in rural Malaysia in the 1950's where traditional life in the village (kampung) is rapidly changing. Is there a book you wish you could "unread"? One that you disliked so thoroughly you wish you could just forget that you ever read it? In one word, no. If a book is really that bad, I will stop reading it...unless it is for my book club. In that case, I will persevere to the bitter end, share my opinion, and enjoy the discussion. If the entire group dislikes the book (and that's only happened once with White Teeth), it becomes a part of group lore that we bring up and laugh about for years to come. Visit Booking Through Thursday to see more answers or leave your own. Jackson, Mississippi, 1962. White ladies playing bridge and sipping ice tea. Colored maids cooking, cleaning, and loving the white babies. The separate, intertwined paths of these worlds are going to collide. Audio is THE way to be inside this story, brilliantly cast with four voices. The separate casting of the three voices of Stockett's debut novel is astute. Jenna Lamia embodies Miss Skeeter, the young aspiring writer who starts a project that disrupts her privileged and predictable world. Lamia's genteel Southern tones can pass off ingrained prejudice with chilling comfort, screech with outrage, and subtly reflect Skeeter's growing resolve and self-discovery. Bahni Turpin and Octavia Spencer contrast the voices of hot-headed Minny and thoughtful, inspiring Aibileen. Their musical speech and emotional connection to the characters are riveting. Listeners are swept up in the story--shocked and reminded by the times; inspired and proud of these women. 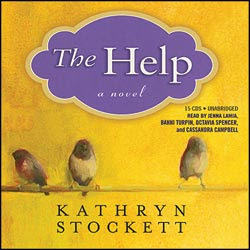 The Help by Kathryn Stockett could easily end up being my favorite audiobook of the year. The novel has already gotten rave reviews from many bloggers (check out Sandy's review from You've GOTTA Read This or Molly's review from My Cozy Book Nook). I will just add my two cents by saying that the audio version was fabulous! The readers' southern accents were perfect and added so much to my overall enjoyment. Not a single minute of this eighteen hour book dragged. As many of you know, I listen while I'm driving alone in my car...and while listening to The Help, I'll admit to to taking the long way home more than once. Whether you're already a fan of audiobooks or are searching for the place to start, I highly recommend The Help! 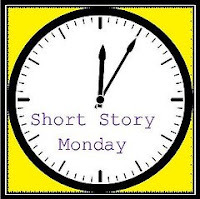 Due to the Memorial Day holiday here in the US, here is another Tuesday edition of Short Story Monday. 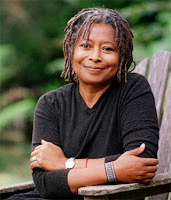 This week's short story served as my introduction to the work of Alice Walker. Everyday Use was written early in her career and appeared in the collection In Love and Trouble: Stories of Black Women in 1973. In the story, an unnamed, uneducated rural black woman who lives with her younger daughter Maggie, tells the story of a disagreement over the ownership of family heirloom quilts that occurs when her elder daughter, Dee, visits from college. Dee returns in "a dress so loud it hurts my eyes. There are yellows and oranges enough to throw back the light of the sun...Earrings gold, too, and hanging down to her shoulders. Bracelets dangling and making noises when she moves...It [her hair] stands straight up like the wool on a sheep. It is black as night and around the edges are two long pigtails that rope around like small lizards disappearing behind her ears." She announces she is no longer 'Dee', but Wangero Leewanika Kemanjo. She has changed her name because she "couldn't bear it any longer, being named after the people who oppress me." A discussion follows in which her mother traces the root of her given name back several generations to the Civil War. Maggie, darker, thinner, slower, and scarred from a house fire ten years earlier, is both afraid and in awe of her sister. She remains in the background as Dee tells of her desire to take some heirloom quilts. Her mother, with Maggie's help, tells the story behind each piece of fabric and how it is reminiscent of a family member. When Dee hears the quilts have been promised to Maggie, she explodes. The quilts will still go to Maggie, and Dee leaves in a huff telling her mother and sister that they just don't understand their heritage and that they really must try and make something of themselves. This story was written at a time when many blacks were striving to rediscover their African roots. While Walker doesn't appear to condemn this rediscovery, she seems to be saying that it should not occur at the expense of preserving American heritage. 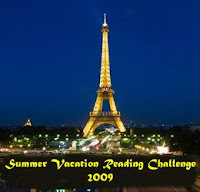 Visit The Book Mine Set to see who else had a short story post this week. Happy Memorial Day weekend! Here in the US, the holiday marks the unofficial beginning of summer. And summer, of course, is that magical time when we, supposedly, can kick back, relax, and and enjoy long, leisurely afternoons of reading by the beach or pool. I'm almost finished with David Howe Colt's The Big House: A Century in the Life of An American Summer Home and, if it's possible, have grown nostalgic for a lifestyle I have never known. My reality is that summer does, indeed, have a different rhythm, but I wouldn't exactly call the days leisurely! The set of activities changes from year to year as the girls' interests evolve. I've chauffeured kids to summer reading programs, a multitude of lessons, games, dance or sports camps, and various friend's homes. This summer, with 16 year old twins, our main focus is on Driver's Education. Two mornings a week will be spent in the classroom and two mornings behind the wheel. I will supplement their driving experience, too....they will do nearly all my driving this summer! My 19 year old is gaining what she hopes will prove to be valuable work experience at as she interns at a local university press. 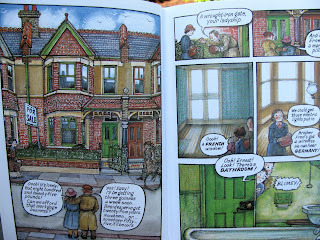 Reviews were posted for The Home-Maker by Dorothy Canfield and Ethel & Ernest by Raymond Briggs (the most charming graphic novel ever). 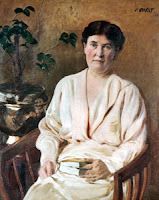 Short Story Monday featured Double Birthday by Willa Cather. I'm nearly done with The Big House...and this is a good thing, since my book club meets on Friday to discuss it! My current audiobook is Brooklyn by Colm Toibin. What will you be reading this holiday weekend? The sun is shining, a long weekend is beginning, and I'm off to the farmer's market. I won a book! 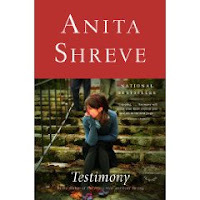 Testimony by Anita Shreve is coming from Nise' at Under the Boardwalk (via Hachette). This is a book I've been coveting for quite some time. Now I can no longer claim to "never win anything". Thanks so much, Nise'! ...and an award! Molly at My Cozy Book Nook has given me The Friendly Blogger award. This is an award that can easily be passed on to everyone that has ever commented on this blog, and to nearly every blog I've visited. Book bloggers are the friendliest people! If you don't know Molly (but doesn't everyone?) stop by and say hello. A best seller in Britain, this winsome little book is one family’s twentieth century, told as a comic strip that fast-forwards through the decades. Briggs’s artful rendering of his parents’ striving captures the English working class, and as the tale progresses, you find yourself slowly sucked into their daily patter, amused by their cooing voices, impressed by their bravery. At the end,you’re hardly prepared for the emotional wallop. Last week, my experiment with graphic novels taught me that there is much more to the genre than science fiction, fantasy and super heroes. This week, thanks to Nan's recommendation, I learned that graphic novels can be as touching, moving, and beautiful as any story told solely with words. 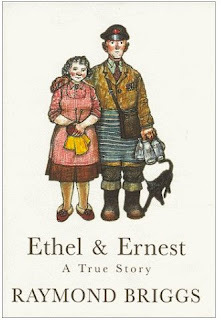 Ethel & Ernest is classified as a biography, but it is really much more. Raymond Briggs has used his remarkable artistic talent to compose an affectionate tribute to his parents. How else would you expect the author of The Snowman to convey his love (and, at times, frustration)? as they make their way through life. We see their quirks and foibles as they interact with each other and with their only child. Turning the last page, there was actually a tear in my eye. What? From a graphic novel? I was shocked! Thank you, Nan, for pointing me toward this little gem of a book. Booking Through Thursday - A Second First Time? My answer, without hesitation, is Pride and Prejudice. Although it's been many years, I'll never forget the feeling I had reading it for the first time. Not being familiar with the plot, foremost in my mind was wondering whether Elizabeth would end up with Mr. Darcy. Now that I know the story and can practically recite many passages by heart, reading the novel brings a different type of satisfaction and comfort. Summer plans include a re-read, so I need to settle on which book I'll read. My three choices are pictured here. A leather bound edition from The Easton Press is on the bottom of the pile. It was a Christmas gift from my husband several years ago. Next is a hardback Everyman's Library edition, which I bought long ago to replace a battered paperback. And finally, the one I'm leaning toward at the moment, is The Annotated Pride and Prejudice (edited by David M. Shapard) which came home from college with my daughter. This question also reminded me of Daughter #1's first reading of Pride and Prejudice. 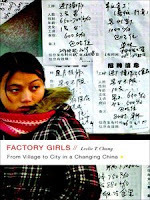 Initially, she had trouble with the language, so I read the first chapter aloud to her. The rest, as they say, is history. She's gone on to read most of Jane Austen's novels, received a trip to London and Bath for her high school graduation last year, and just completed a Jane Austen in Film class at college. Twin A (16) is planning to read Pride and Prejudice for the first time this summer. I hope she, too, finds wonder and delight in the world of Jane Austen. To see more answers, or add your own, visit today's Booking Through Thursday. Although this novel first appeared in 1924, it deals in an amazingly contemporary manner with the problems of a family in which both husband and wife are oppressed and frustrated by the roles that they are expected to play. Evangeline Knapp is the perfect, compulsive housekeeper, while her husband, Lester, is a poet and a dreamer. Suddenly, through a nearly fatal accident, their roles re reversed: Lester is confined to home in a wheelchair and his wife must work to support the family. The changes that take place between husband and wife, parents and children, are both fascinating and poignant. The characters are brought to life in a vivid, compelling way in a powerful novel more relevant now than when it was first published. The Home-Maker is one of those "time lost" novels whose recovery will entertain and intrigue whole new generations of readers. From the very beginning, that old expression "You’ve come a long way, Baby!" kept running through my mind. Strict, inflexible ideals of 1920’s society dictated ‘appropriate’ familial roles. A wife was expected to remain home and attend to all domestic concerns, while her husband ventured out into the world to provide for his family. Adhering to these ideals was virtually draining the life from the Knapp family. My heart ached for Evangeline (Eva) Knapp, her husband Lester, and for their children, as each one strove to fulfill these expectations. Lester, a poet at heart, is equally unfulfilled in his office job at Willing’s Emporium. The two elder children, weak and timid, suffer from various physical ailments, while Stephen, the youngest, is robust, wild and utterly unmanageable. These physical ailments, from Eva’s eczema to Lester’s digestive troubles, seem to serve as an indicator of hard times ahead. The situation reaches a crisis when Lester loses his job and contemplates suicide. On the way home, an accident occurs that leaves Lester confined to a wheelchair. Eva must get a job to support the family. What follows is Canfield’s masterful portrayal, in clear, simple prose, of how each family member responds to this change of situation. As health concerns gradually fade, all seem to come truly alive for the first time. The insight into the effects of societal pressure is breath-taking. My rating for The Home-Maker is a perfect 5/5. I knew I could count on Willa Cather! Her story, Double Birthday, was the perfect follow-up to last week's disappointment. Her novels My Antonia and O Pioneers! are among my favorites, so I figured no chances would be taken by choosing one of her short stories. "Even in American cities, which seem so much alike, where people seem all to be living the same lives, striving for the same things, thinking the same thoughts, there are still individuals a little out of tune with the times - there are still survivals of a past more loosely woven, there are disconcerting beginnings of a future yet unforeseen." Albert is a middle-aged man who has spent his inheritance on travel and opera tickets, and is now content to live a simple life filled with classical music and books with his elderly uncle (also named Albert). He is planning an 80th birthday party for his uncle, which happens to coincide with his own 55th birthday, when he runs into Judge Hammersley, an old family friend. The Judge says champagne is needed to properly celebrate the occasion, and invites Albert to his home to pick some up. It should be noted that this story takes place during Prohibition. The Judge instructs his widowed daughter, Margaret, not to invite Albert to stay since he is a man "whom one is...a little embarrassed to meet, because they have not got on as they should." When Albert arrives at the house, he and Margaret reminisce about time spent in Rome during their younger years. Days later, Margaret decides to drop by Albert's home for the double birthday party. They have a lovely time and she proposes a toast "to the future; to our friendship, and many dinners together. I like you two better than anyone I know." The story then closes with a wonderfully poignant conversation between Albert and his uncle. Willa Cather delivers a near perfect short story experience and reminds me, once again, how much I have enjoyed her novels. Death Comes For The Archbishop is on my shelf, and I'm considering adding it to my list for the Classics Challenge. I know I'll be reading more of her stories, too. Visit John at The Book Mine Set to see who else has a shorr story to share today...or link to your short story post. Good morning! This week I've noticed a new phenomenon here at the lake...we are "easing into summer". In years past, when we had three students at the public high school, summer began very abruptly. It happened in late June, the date determined by the completion of the final Regent's Exam. Life is very different this year. Daughter #1 started college, Twin A transferred to a local private prep school, and Twin B became the family representative at the public high school. Summer, as it turns out, will be a gradual process in our household. Daughter #1 had her last exam on Tuesday, loaded up the Jeep, and headed home to begin her summer. That meant sleeping until almost noon, mountains of dirty laundry, and piles of 'stuff' all over the house. The rest of us, still on the school year schedule, got up between 5:45 and 6:15, tripped over daughter #1's stuff, and headed to the kitchen to pour our coffee. Twin A and Twin B were quite envious, but Daughter #1's vacation is over. Her summer internship starts tomorrow morning. Twin A has two weeks of classes left, followed by three days of finals. Her summer begins June 3. Twin B won't finish her last exam until June 23 or 24. I don't think it's really registered that she'll be going to school for weeks after her sister is done...and I sure don't want to be around when it does! As far as reading goes, I took a slight detour and experimented with graphic novels last week. After browsing though a how-to book (did you know there was such a thing for graphic novels? ), I read and reviewed American Born Chinese by Gene Yuen Lang. I also finished The Help by Kathryn Stockett and will post a review this week. A review of The Home-Maker by Dorothy Canfield should also be up in a day or so. Tomorrow I'll have a story by Willa Cather for Short Story Monday. I'm currently reading The Big House: A Century in the Life of an American Summer Home by George Howe Colt. It is my bookclub's May selection. I've listened to a few lectures from The Teaching Company's Classic Novels course this week and have decided that I really need to read Wuthering Heights. I don't have an audiobook in progress at the moment. Can you suggest one that you've enjoyed? Beach Bumb: you will read 3 books during this time frame (a leisurely book-a-month); cross-over book selections from other challenges may count; and you do not have to list books in advance -- after all, summer vacation is a time for spontaneity. If things go well in Venice, however, I may end up spending the entire summer in Italy. I'm very anxious to get to Elizabeth Von Arnim's The Enchanted April, and I see that Marlena deBlasi has a new book set in Sicily. We'll see where I end up! Read more about the challenge and sign up here. Thanks for hosting, Molly! Last week's Booking Through Thursday topic was graphic novels. In my response, I admitted total ignorance on the subject. However, by spending a little time reading other BTT answers, I got some great suggestions and decided to test the water myself. Heather left a comment directing me to her very informative post. 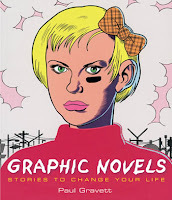 She pointed me toward Graphic Novels: Everything You Need To Know by Paul Gravett. My library didn't have this title but, thanks to inter-library loan, I was able to pick it up just a few days later. It is an excellent primer on graphic novels. Gravett lists 30 of his favorite titles and goes on to show sample pages (complete with suggestions on how to read them). He also points out themes, keywords, and special features. By leafing through this book, I found I was drawn to color illustrations...and preferred to steer clear of the sci-fi, super hero, fantasy world. So, I checked out American Born Chinese by Gene Luen Yang. It won the Michael L. Printz Award, was a National Book Award finalist, and was mentioned by at least a couple of bloggers. American Born Chinese tells three separate stories. First is the Chinese fable of the Monkey King trying to rise above his heritage. The story of Jin Wang, a lonely, Asian American middle school student trying to fit in is next. Finally we have Chin-Kee (purposely the ultimate negative Chinese stereotype) who ruins his popular cousin Danny's life with his yearly visits. Yang then weaves these stories together and delivers a powerful message of self-acceptance. I'm glad I had the opportunity to read American Born Chinese and will be suggesting this title to my nephew in middle school. My name is JoAnn.....and I am a book glutton. There, I've admitted it! I buy books faster than I can possibly read them, but I am getting better. The stack on the left are books I've bought in the past couple months and am either reading now, or plan to start soon. There are others that I've recently purchased and read, but far more that have been purchased long ago and remain unread on the shelf. Taking a picture of all those books would depress me, so I'll skip it. My book buying has slowed considerably in the past year. First, I'm using the library much more, and second, I try to buy a book ONLY if I'm going to start reading it within the next few days. While this has helped, I really need to dedicate a year to reading books I already own. Nan at Letters From a Hill Farm is not buying or borrowing books this year. She has recently posted a progress report on her project. I don't have the will power to carry it that far, but I can at least strive to curb the purchasing and read from my stacks. You can read more answers or add your own here. More teasers can be found here. It's Monday and that means short stories! Today's post, unfortunately, will follow a good news/bad news format. After two weeks of short story Tuesdays, the good news is that I'm writing this post on Monday. 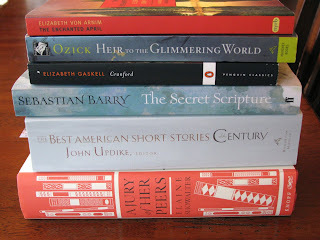 More good news - I bought The Best American Short Stories of the Century edited by John Updike. It was purely an impulse purchase, but now I have a fresh, new supply of stories. And finally, I sat down and read two stories as soon as I got home. "I am in love with my wife," he said - a superfluous remark, as I had not questioned his attachment to the women he had married. We walked for ten minutes and then he said it again. I turned to look at him. He began to talk and told me the tale I am now about to set down. What follows is the brief account of an encounter that takes place shortly before the man's wedding and how it has affected him. He had never before spoken to the 'other woman' (who is ten years older), yet she captured his imagination. I'm not sure why I read this story, since I didn't really like Anderson's Winesburg, Ohio either...perhaps it was the title. "Ever had any bizarre thoughts?" asked the doctor. Mr. Trexler failed to catch the word. "What kind?" he said. "Bizarre," repeated the doctor, his voice steady. He watched his patient for any slight change of expression, any wince. It seemed to Trexler that the doctor was not only watching him closely but was creeping slowly toward him, like a lizard toward a bug. There are several more sessions. Trexler tends to identify with the doctor, virtually transferring himself to the doctor's seat. The story ends with Trexler's thoughts when the question "What do you want?" is posed. I've never read anything else E.B. White has written for adults, but I doubt I'll be searching for more. Visit The Book Mine Set to see who else is sharing thought on short stories today. TSS - It's Mother's Day! Happy Mother's Day! I've finished off a delicious pancake breakfast, opened some gifts, and have now settled in with my laptop for a few minutes before preparing Mother's Day dinner for my mother. I'm happy to report that this has been a somewhat more productive reading week. After two busy weekends on the road, we are finally spending one at home and I have finally finished a book! My review of The Home-Maker by Dorothy Canfield will be posted later this week. This week's short story, The Lady's Maid's Bell by Edith Wharton, was a wonderful surprise. I was expecting a story of New York's Gilded Age, but found myself wrapped up in a ghost story instead! I started reading The Big House: A Century in the Life of an American Summer Home by George Howe Colt. It is my bookclub's May selection and already has me wishing for a long, leisurely summer on the Cape. I also printed out Virginia Woolf's essay How Should One Read a Book? to read later this week. Two new books were purchased this week. The first, The Best American Short Stories of the Century edited by John Updike, was totally an impulse purchase. If you've been reading this blog for any time at all, you'll know that I rediscovered short stories this year. A Short Story Monday post has become a regular feature here and I've discovered some very talented writers. This collection was just too appealing to leave behind. As soon as I got this book home, I sat down and read two stories for tomorrow's post. The other purchase (the one that I went to the store armed with a 30% off coupon to make) is A Jury of Her Peers - American Women Writer's from Anne Bradstreet to Annie Proulx by Elaine Showalter. This is a book I brought home from the library, but quickly decided I needed to own it instead. I'm not sure yet if this will be a book to read straight through, or whether I'll pick it up to read a chapter here and there. Either way, I know I'll enjoy working my way through it! - Do you read graphic novels/comics? Why do/don’t you enjoy them?- How would you describe the difference between “graphic novel” and “comic”? Is there a difference at all?- Say you have a friend who’s never encountered graphic novels. Recommend some titles you consider landmark/”canonical”. My answer this week is short and sweet. I have NEVER read a graphic novel! It's not that I don't like them, it's just that I am so overwhelmed with the choices and haven't got a clue where to start. I am also in the dark about the very basics - are graphic novels the same as manga? Visit today's BTT to see other responses and play along! My trip to the library yielded exclusively non-fiction titles this week! I enjoy reading non-fiction and, prior to this year, usually had one in progress at all times to complement the current novel. Lately short stories (and the occasional essay) seem to have filled the nonfiction slot, but I'll be rectifying that this month. This is the May selection of my bookclub. I wish I could remember where I first read about this book, but it sounded fascinating. My hold finally came in. My short story reading has lead to the discovery of two new writers (so far) - Tillie Olsen and Susan Glaspell (author of A Jury of Her Peers). BookPsmith pointed me to this book via Dovegreyreader. So far, it looks like a book I'll want to return to over often...and may end up purchasing! What did you find at the library this week? 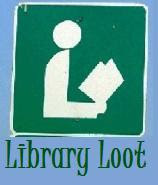 Library Loot is hosted by Eva and Alessandra. I'm a day late with Short Story Monday again this week, but I suppose a Tuesday post is better than none at all, especially if it's a story by Edith Wharton! I found The Lady's Maid's Bell on line and decided to print it out and take it along on my travels last weekend. What I expected to be a story about New York's Gilded Age (like The Custom of the Country or The House of Mirth) turned out, instead, to be a ghost story. Alice Hartley, a lady's maid recently recovered from a bout of typhoid, has trouble finding a new position until an old friend sends her to Mrs. Brympton. The new employer, herself youngish and somewhat of an invalid, lives year round in the country and is in need of a maid/companion following the death of her long-time maid Emma Saxon. Hartley is told that it will be a dull, gloomy job, but she will be fine as long as she stays clear of Mr. Brympton, who is rarely at home anyway. Upon arriving at the house, we get the first hint that all may not be well. Hartley is shown to her room upstairs and notices another woman, also dressed as a maid, standing in the hallway. However, the housemaid leading the way doesn't seem to see her at all and is instead concerned that a door, meant to be locked, has been left open. We also learn that since the death of the beloved maid Emma, the Brymptons have had trouble keeping a lady's maid for more than a few days. One night, the bells rings in Hartley's room (odd since Mrs. Brympton has said she does not use the bell). Unusual footsteps are heard in the hall and Hartley rushes to her mistress's side. Mrs. Brympton calls out for Emma and then claims to have been dreaming. She tells Hartley that the bell was not rung and instructs her to return to her room. Before she leaves, Mr. Brympton asks, "How many of you are there, in God's name?" Soon afterwards, a photograph of Emma Saxon is found. She is the same woman Hartley saw in the hall, but nobody in the household seems willing to talk about her. I won't say much more about the plot, except that some of the events seem to make little sense. Nonetheless, this was a very compelling Gothic style story. I have my idea of what happened and would love to hear yours if you decide to read this story. During my reading, I was reminded of Henry James' The Turn of The Screw (1898). Of course, Wharton and James were great friends. The Lady's Maid's Bell was published in 1902, the same year Edith Wharton moved into her 'first real home', The Mount, in Lenox, Massachusetts. James spent a great deal of time there, even having his own guest suite, and it's fun to imagine the two of them strolling through the gardens discussing ghost stories! To see other Short Story Monday posts visit The Book Mine Set. Another weekend on the road has lead to another Monday morning edition of The Sunday Salon. This time we were in Buffalo for the final tournament of Twin A's club volleyball season. The highlight of the weekend was spending some time with my college roommate. She picked me up at the tournament sight on Saturday for a leisurely lunch (far away from the whistles and cheers of the court center!) and then we took a walk through her gardens to check out the latest projects and experiments. We don't see each other often enough, so this was a real treat! The girls played well in the tournament until finally getting eliminated in the semi-final round Sunday afternoon. Between getting caught up from the previous weekend's travel and preparing for this one, not much reading happened last week. My car was in for repairs (with my audiobook of The Help inside), so there wasn't much progress on that front either. My reading goals for the week ahead are the same as last week's - finish The Home-Maker by Dorothy Canfield, continue listening to The Help by Kathryn Stockett, and read at least one short story or essay. I plan to sign up for Molly's Summer Vacation Reading Challenge later this week and have also been eyeing Rose City Reader's Sunshine Smackdown: Battle of the Prizes. I resisted Trish's Non-Fiction Five Challenge that started May 1, but my non-fiction reading is way down this year and I may need this challenge to help me get back on track. So, here's to a more productive week. Did you meet your reading goals last week? In a world where religion seems to grow increasingly irrelevant "The Shack" wrestles with the timeless question, "Where is God in a world so filled with unspeakable pain?" The answers Mack gets will astound you and perhaps transform you as much as it did him. You'll want everyone you know to read this book. My book club met last Friday at the local coffee shop (which we tend to think of as our community living room) to discuss The Shack by William Paul Young. There were nine members present and seven had read the book. The discussion started off very tentatively. We knew this to be a book people have strong feelings about and were trying to gauge where others stood. As it turned out, the member that raved about the book and suggested we read it was not present. The rest of us were somewhere between mildly positive and take-it-or-leave-it. Even though there were no especially strong/vocal opinions on the book, it ended up being one of the best discussions we’ve had in recent memory. We recognized how this could be perceived as an uplifting, even life-changing book for some and how it challenges our perception of God. A couple members even shared personal experiences they’ve had with God/Jesus. One talked about reading very quickly through the beginning of the book, then having to slow down and take a break to let it all ‘digest’ as things became more ‘philosophical’. I voiced the most negative comments – mostly having to do with the writing (which I thought was mediocre at best) and the ‘outer’ story. Within the first few pages, I had the urge to throw the book across the room, but quickly remembered that I was on an airplane, and this was for book club…so, instead, I read on. The ‘inner story’ presented many ideas to think about and discuss – why bad things happen to good people, the idea of God and heaven, what happens to people after they die, etc. Christian/Inspirational fiction is a category I have very little experience with and would consider to be outside my normal comfort zone. Though this is a book I never would have picked up on my own, I am not sorry to have read it. In fact, I was very glad to be able to participate in the discussion. That said however, I will not be recommending The Shack to anyone (except possibly my mother).